1. Identify the right and left sides of the heart. Look closely and on one side you will see a diagonal line of blood vessels that divide the heart, this line is called the interventricular sulcus. The half that includes all of the apex (pointed end) of the heart is the left side. 2. Locate the coronary arteries and veins that are on the surface of the heart. 3.. Find the flaps of dark tissue on the top of the heart. These ear-like flaps are called auricles. 4. Tne front-most vessel is the pulmonary trunk. Place a probe or pencil in this vessel to mark its place. 5. Just behind the pulmonary trunk is the aorta. Depending on how the heart was removed, you might also see a branch of the aorta called the brachiocephalic artery. Place a pencil or probe in the aorta to mark its place. 6. Turn the heart so that you are looking at its dorsal side (the back of the heart.) 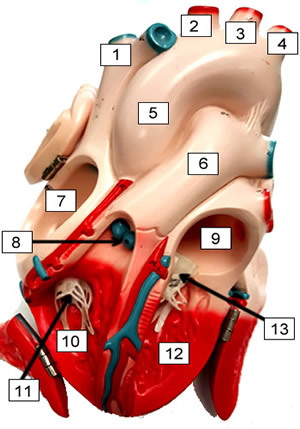 Find the large opening at the top of the heart next to the right auricle. This is the superior vena cava. Place a pencil in this vessel, you may also use your finger to feel the inside of the right atrium. 7. Locate another opening on the backside of the heart on the left side. This is the pulmonary vein.You can feel the inside of the right atrium by probing this opening with your finger. 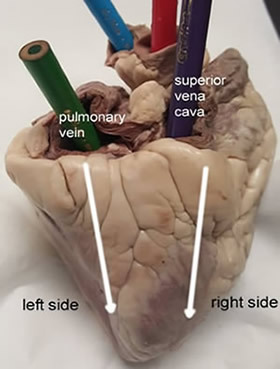 Place a pencil in the pulmonary vein opening. 1. Use a scalpel to make an incision in the heart at the superior vena cava. The incision should follow the line of the right side of the heart so that you can open just the right side and see the right atrium, the right ventricle, and the tricuspid valve between them. 2. The chordae tendineae, also called the "heartstrings" can be found attached to the thin flaps of the tricuspid. 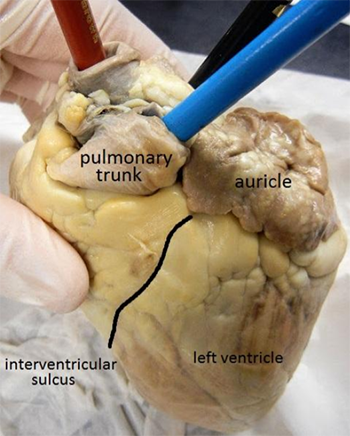 They are anchored to the wall of the heart at the papillary muscle. 3. Make a similar incision on the left side of the heart to expose the left atrium, left ventricle, and the bicuspid valve. 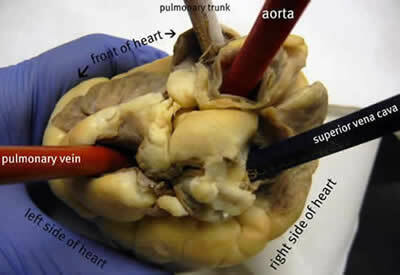 You will also be able to see the chordae tendineae and the papillary muscle on this side of the heart. 5. Insert a probe into the aorta and observe where the probe exits the heart. You may even be able to find the small aortic semilunar valve a the place where the aorta connects to the heart. This valve does not have chordae tendinae and was likely broken when you identified the aorta in the first part of this activity. ** Compare the heart of the sheep to human hearts by viewing various heart models in the room.